JOHN(CHRYSOSTOM? ): EXCERPTS. FROM THE DISCOURSE OF MAR YO'ANIS ON THE PASSION? Description	 MS in Syriac on papyrus, Syria, 9th-10th c., 1 partial f., 9x10 cm, single column (9x9 cm remaining), 19 +16 lines in Syriac Sertâ book script. Context	 The present f. belongs to the same MS as Firenze PSI Inv. 3020, published by J-M. Sauget: Le fragment de papyrus syriaque conservé à Florence, Annali dell'Istituto Universitario Orientale di Napoli, 45(1985), pp. 1-16. The Florence folio is immediately preceeding the present MS.
Provenance	 1. Monastery of the Syrians in the Nitrian Desert (ca. 10th c-); 2. Maggs Bros., London. 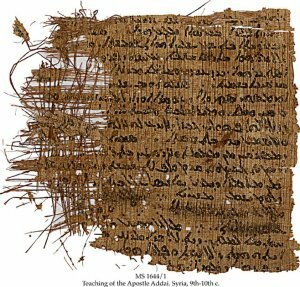 Commentary	 Syriac papyri are extremely rare. In the 10th c. Moses of Nisibis, abbot at the Monastery of the Syrians, built up an extraordinary fine collection of Syriac MSS, which today forms the basis of the Vatican and British Library collections of Syriac MSS. Published	 Sebastian P. Brock: Two Syriac Papyrus Fragments from the Schøyen Collection; in: Oriens Christianus, Band 79, 1995, pp. 9-22.